Last night at Reliant Arena in Houston, TX, light welterweight Danny Garcia graduated from contender status to world class by prevailing in a tough fight with Mexican legend Erik Morales to capture the WBC title. Morales had given up the title on the scales the day before when he was two pounds over and Garcia, at 24, eleven years the junior of Morales, was the only one able to actually win the title as a result. During the first two rounds, Morales controlled the action with a great jab that allowed him to land his lethal right from the outside as well as get inside and score with crisp combinations. The third saw Garcia reverse the tide as the Philadelphian caught the champion with body shots and a couple of sharp rights but could not fully take control as Morales once again gained the upper hand in the next round, nailing the younger man with hard rights. The middle rounds saw the action see saw back and forth as both fighters had their moments, dishing out and absorbing punishment in a clash between the experience of Morales and the youthful quickness of Garcia. 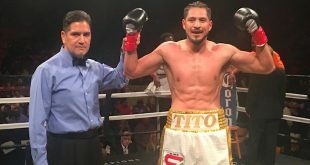 By the later rounds, Morales was slowing down, unable to keep Father Time at bay any longer as the fresher Garcia was definitely leading the way but the Tijuana man somehow found a way to get back into the bout in the tenth and in the early part of the eleventh until he was canvassed by a perfect left from Garcia. Morales beat the count and hung on to see the round's end but was unable to put a stop to Garcia's run of success in the final frame, losing a 118-109, 117-110, 116-112 unanimous decision. Could this be the final contest of the amazing career of Morales? The 35 year old former four-weight world champion now stands at 52-8 (36) while Garcia hits the big time at 23-0 (14), winning his first world title bout. The undercard saw a good scrap at light middle as southpaw slugger James Kirkland took on hard-nosed pressure artist Carlos Molina for Kirkland's WBC Continental Americas strap. 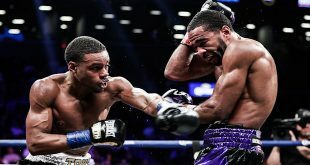 With Kirkland coming off a win against Alfredo Angulo and Molina a victory over Kermit Cintron, the winner of this one would not be far from a world title opportunity and the combatants certainly fought as if their futures depended on it. The first half of the scheduled 12 rounder belonged to Molina, outworking Kirkland, who was looking to load up with single shots that never seemed to come. Molina began to feel the effects of his high energy approach by the ninth and could no longer hold off the fresher Kirkland as the lefty was by now ramming home hurtful punches. 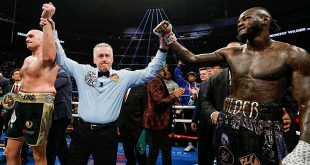 In the final seconds of the tenth, Kirkland dropped Molina, who quickly got to his feet as the bell to end the round rang but referee Jon Schorle was still reciting the mandatory eight count as Molina's corner entered the ring, thereby disqualifying their fighter. Kirkland see his record to 31-1 (27), Molina goes to 19-5-2 (6).